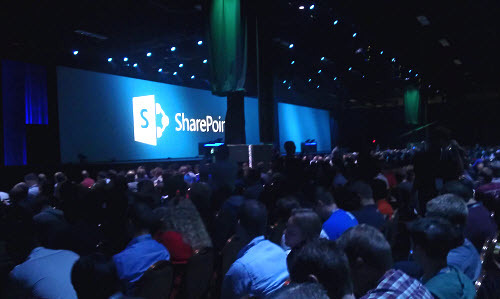 The 2012 Microsoft SharePoint Conference was held in Las Vegas the week of November 12. It was an enlightening, interesting, and at times exciting experience. Conferences such as this are usually two parts education, one part networking, one part dog-and-pony show, and one part pep rally; this gathering was no exception. It was a somewhat surreal experience to be one of 10,000 SharePoint evangelists, enthusiasts, and worker bees for four days of seminars and assorted activities. Witnessing the well-oiled machine of the Mandalay Bay catering team as they funneled us into a cavernous facility with endless repetitive buffet lines for meals was worth the trip all by itself. 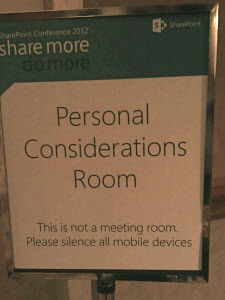 Throughout the conference, the social networkers among us (including me) checked in on Foursquare and Facebook and posted Tweets with the hashtag #spc12. During the keynote presentation, so many of us Tweeted that #spc12 was the number one trending hashtag. I also earned a Swarm badge on Foursquare. The conference officially kicked off with a keynote presentation, led by Microsoft’s Senior Director of Product Marketing, Jared Spataro. (You can watch the presentation online at http://www.mssharepointconference.com). Comedic sketch attempts aside, this presentation to launch SharePoint 2013 set the tone for the whole conference: It’s a brand new SharePoint. All the familiar elements are there, all the tools and features you are used to, but SharePoint 2013 is a sleek, updated platform with more punch than ever before. With 2013, Microsoft has done what it always does; taken a look at what’s happening in the digital world and synthesized pieces, absorbing the new realities of how people work and interact with digital devices. As is also typical, they’ve built on these realities and added their own twist. The result is an interface that will look oddly familiar to about one billion people; anyone who dabbles in social networking for either work or personal use will be impressed with the vast improvements in the way these paradigms are incorporated into the collaborative focus of SharePoint. There are significant changes in some of the underlying technology and implementation options. There are also improvements in ease of use, performance, power, feature sets, and extensibility. As usual, there are also shortcomings; improvements or enhancements that would seem to be obvious which aren’t there, or features that still fall short of what might be desired. There are changes that are puzzling in some ways. There are rumblings of more changes to come that may not sit well with the community. With any new release there will also be glitches as all the bugs get worked out as the software is released into the wild. So, there’s a lot of change; whether good or bad in each case may depend on one’s perspective. There were around 300 breakout sessions, covering many aspects of SharePoint 2013 and related products and technologies such as Office, Project, Project Server, Visio, Yammer, and others. Whether your role is as a business user, a developer, an administrator, or jack-of-all-trades, there were sessions to match your needs. There were overviews and deep dives, technical nerd-outs and philosophical discussions. At any given break-out slot it could be hard to pick which session would be the best choice. Luckily, video of each session is available to attendees for a few months, so I’m going through and watching the sessions I wanted to attend but couldn’t. It’s a lot to take in, and of course we are doing our own research, exploration, and experimentation. In the coming weeks and months you’ll be hearing more from us about this next wave of SharePoint. In fact, we have already scheduled the first round of classes for those who will be upgrading to SharePoint 2013 from previous versions: Exploring SharePoint 2013 - New Features: Preparing Users for Upgrade and Migration. I’m not going to detail the many changes and new features here, but I will hit a few of the major potential game-changers. The Cloud, The Cloud, The Cloud. The Cloud. Have I Mentioned The Cloud? Some in the community agree that the cloud is a no-brainer, others believe it’s a non-starter, and many, many others are unsure. The benefits can be considerable, but the potential drawbacks are certainly worth considering. During the conference, Office 365 actually experienced a brief outage. It’s one thing for an organization to experience downtime with systems under their complete control; it’s quite another for it to happen when the systems are under someone else’s roof. My crystal ball is out for repairs, so I have no prediction for the outcome. I will say I’ve seen this thick-client vs thin-client pendulum swing back and forth a few times in my career. Stay tuned. The importance of social networking in today’s world is hard to deny. It’s true that I know many people – including a majority of our students – who don’t Twitter, who don’t LinkedIn, and who barely Facebook. Still, social computing is a modern fact of life, and many people (especially the under-30 crowd) see social applications as an integral part of their on-line life. Many people are much more likely to text, tweet, status-update, check-in, etc., than they are to make a phone call or send an email. Such communications are briefer, faster, can be more connected to other communications and data, and have the potential to be simultaneously broadcast to a wider audience and targeted to self-selected recipients. The MySites feature in previous versions of SharePoint was an attempt to incorporate social computing into SharePoint, but it always seemed to be a step behind current trends when a particular version was released. In addition, it didn’t really integrate with the other sites the user might have access to – it was more like an annex than a lobby. Many organizations did not even implement MySites, choosing not to activate the feature at all. In other organizations, MySites might have been activated but has never really been used. It looked and functioned like an adjunct to the primary functionality and purpose of SharePoint. It had clear business purposes, but it could be difficult to convince users and decision-makers how it might fit into – never mind improve – their current work habits. The terms “social networking” and “social computing” are partly to blame, I feel. Decision makers believe or fear that social = frivolous rather than understanding that it just means collaborative in this context. Unfortunately, the terms seem to be here to stay. Enter SharePoint 2013. The case for social computing in SharePoint – and in the enterprise – has never been clearer. In addition to the personal workspace, profile information, and document sharing capabilities that have always been part of MySites, the 2013 edition – rebranded as SkyDrive Pro -- incorporates more collaborative, tracking/notification, and personal work management tools than ever. Microsoft has picked up the flow of how sites like Facebook and Twitter work and how users interact with them. They’ve folded tagging, mentioning, following, and more into the new Newsfeed and other elements. In addition, it’s possible to have “conversations” on individual sites. Imagine a site centered around a particular project, and there on the site is a newsfeed where the project team, stakeholders, management, etc., can participate in an open conversation about the project. It’s right there on the home page, less structured than a discussion board, and deeply familiar to the vast majority of current computer users. Think of how that would drastically reduce the number of emails that float around, and the increased documentation and information sharing that would take place. Finally, there’s an increased focus on providing aggregation of everything you are doing and tracking throughout the SharePoint system in order to provide “one-stop shopping” for all of your work. For organizations that already use MySites in a significant way, 2013 should be welcomed with open arms. For organizations that don’t use MySites, or who have it but don’t know what to do with it, a fresh look and thoughtful implementation of SkyDrive Pro could be well worth it. A twist to the integrated SharePoint social components is Microsoft’s recent purchase of the messaging system Yammer. Yammer was definitely a shiny new toy at the conference that Microsoft was eager to showcase. It is estimated that over 80% of the Fortune 500 user Yammer in the enterprise. Being a new purchase, though, Yammer is not yet integrated with other Microsoft products. They promise that it will be incorporated in the future, but right now it is redundant with other social features already in SharePoint. SharePoint 2013 is multiple-device-centric. Not only are the mobile device interfaces improved, but the assumption is that any given user may be using SharePoint over a wide variety of devices – not only a desktop plus a laptop, but perhaps a smartphone or a tablet. While Internet Explorer will still (and probably always) provide the optimum experience, the attempt to be OS/browser/device agnostic is even more earnest. Finally, the biggest change – depending on how a given organization implements all the features – is that there’s a shift to thinking about focusing the experience on the user rather than the machine. The idea is that it doesn’t matter what device you are on, you can always get to “your stuff” in a seamless way, without depending on bookmarks/shortcuts which are device-centric. Business Intelligence tools have long been a part of SharePoint, but with each version they become more and more robust. SharePoint 2013 is no exception. To me some of the most exciting enhancements are actually part of Excel 2013. These include features like FlashFill data pattern recognition, Slicers to provide customized data filtering options, and more. Combine this with enhancements to Excel Services and you have a much more robust feature set for displaying and manipulating data in spreadsheet form. Access Services has also gotten a makeover, and Microsoft seems to have a refreshed interest in Access in general. A new tool called PowerView provides new capabilities for interactive data modeling. Enhancements in Visio Services, PowerPivot, and PerformancePoint round out the package. There are disappointments, but BI in SharePoint is definitely beefier and more tasty. Anyone with a smart phone or a tablet device is familiar with the concept of apps – applications. These are usually small programs with a focused purpose. They may be a stripped-down version of a web site, or they may be a stand-alone program of some type. Microsoft has embraced the app model and married it to SharePoint. Not only can developers create open-source apps to sell (or provide as freeware) in Microsoft’s app store to add or enhance SharePoint functionality, but the data features in SharePoint – what we currently call lists and libraries – are now apps. Search is an essential tool for information storage and sharing in computing. The SharePoint search tools have been good in the past, but the 2013 version is, as expected, even better. The big news is that FASTSearch, which was a separately-purchased add-on for SharePoint 2010, is the core search technology for SharePoint 2013. In addition, the way Search crawls, indexes, queries, and displays content has been redesigned. Users can view a preview of a document before opening it, and can even interact with it to a limited degree. Results are often grouped or prioritized based on search frequency, ratings, and context. The new Search is a rich area for improving usability of SharePoint sites, and I look forward to exploring it further. Project Server and SharePoint have been closely aligned since SharePoint’s beginning. With each new release, the two platforms become more integrated. There are those who even believe that eventually Project Server will become a fully integrated part of SharePoint, becoming in essence Project Services to parallel Access Services, etc. In this edition, Project Server is also an optional component of Office 365 as well as being available for onsite implementation. One of the most exciting features that I saw was that not only can you publish a Project Professional plan to a SharePoint task list (without Project Server), but that that plan can then later be converted to a published plan in Project Server. In this way, the project manager and directors/executives can still leverage all of the resource and portfolio management tools in Project Server, while team members and stakeholders can view (and in some cases, even interact) with the plan in the SharePoint site. This opens up a whole new workflow paradigm, especially for those teams or organizations who have been reluctant to use Project Server, yet use SharePoint for the nuts and bolts of project documentation and collaboration. Note: Task lists themselves have had an amazing makeover, and I can’t be more excited about the prospect of teaching this new functionality. I don’t have the space to go into everything here, but in the context of project management I do want to point out one innovation. A soon-to-be-released App was previewed at a session I attended. This app will allow users to view and manage a Task list in a graphical “tile wall,” typical of agile project management. Again, this could be a huge improvement in functionality for organizations that feel their project management style has not been a good fit for Project / SharePoint.